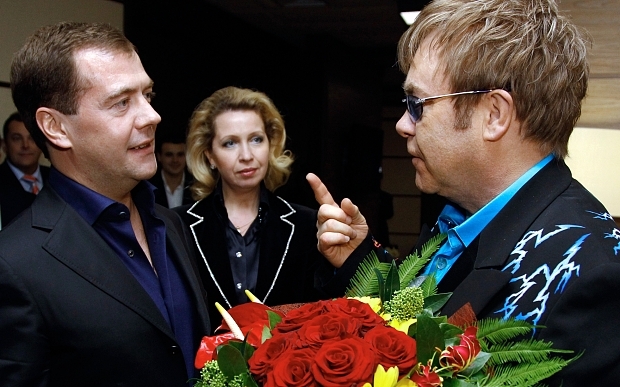 The Russian comedians Vovan and Lexus appeared on Russian TV to release the conversation, in which Sir Elton was asked to discuss gay rights. I’d imagine Elton was genuinely hurt when he found out it was a hoax because he sounds like he thought he could of made a difference. But the thing about Putin and his stance on gay people – and I’m sure Elton gets this – is that President Putin doesn’t care about people being gay – he cares about his own popularity. By attacking minority groups & saying that they are the root of Russia’s problem – it distracts from the real issue – of his failing government and the corruption that surrounds it and props it up. I hope that this audio was played in Russia – because as far as prank calls go – it wasn’t particularly funny – but it does show how much Sir Elton cares about Russian people – more, it could be said – than Vladimir Putin. I wonder if Vovan and Lexus thought about carrying out the same type of prank or President Putin? Or, if they decided they didn’t fancy a long spell in a Russian prison – worse still – getting a bullet in their head – a fate that has befallen many a Russian journalist – because that is how politics works over there.